As I am free right now(gila boring! ), so will share with you this 12 Steps To Deal With Unrequited Love(taken from Farra O Mei Facebook 's notes..thanks Fara for sharing this with me ^_^..ko tak bagi pun aku nak share juga..hihi). Accept the fact that he doesn't feel the same way about you. If you continue to believe that there is a chance he will eventually love you, you will never move on(plus kena doa banyak-banyak). Understand the reasons why she/he doesn't feel the same way. 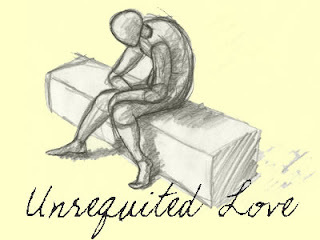 Understanding the reasons for the unrequited love will help you to move past the situation and get over her/him(bunga bukan seekor, kumbang bukan seekor..eh,terbalik..but kira acceptable jer lah kan..haha). Stay positive. Don't let this situation cause you to have bitter feelings toward finding someone who loves you. Get your mind off of him. Spend more time with friends and family, and surround yourself with those who love and care about you(tak pun pergi shopping,time ni lah nak beli banyak-banyak tanpa risau kena marah dengan ayah..sebab ada alasan,tengah sedih >_<). Focus on your future. Nobody has ever moved forward by constantly looking back. Focusing on your future will make you take your focus off him(fikir macam mana nak cari bf yang berganda lagi hensem dari dia..like my HJ..eheh). Remind yourself of your good qualities. Just because one person does not love you does not mean you are not a good person. Remind yourself of that as often as necessary(means kena selalu perasan!!haha). Go out on dates. It may be difficult at first because your heart may still belong to him but the worst that could happen is that you meet someone you like to hang out with. You never know, you may meet someone you really like that feels the same way about you( I want to meet HJ!). Appreciate yourself. Realize that you don't need anyone to validate you and that you are still the wonderful person you were before the breakup. Remind yourself that most relationships don't work out and that your breakup isn't unusual. Work on gaining independence so that you can be just as happy alone as when you're in a relationship. That will make you more attractive. If you've been left before, think of how you overcame that pain. You did it once, you can do it again(gila kesian kalau asyik kena dumb jer! !tak boleh jadi ni..mmm). Don't feed the monster. After a week or two of grief, stop yourself from indulging conversations about your lost love or from obtaining information about them. In time, your grief will fade on its own, provided you let it(dont feed the monster = dont think about the monster..ops,terlebeh sudah..haha). Ask yourself, "Why would I want to be with anyone who doesn't love me back?" You deserve better. You may discover you are repeating a pathology from your childhood, clinging to someone who doesn't appreciate you in an effort to win the approval you could not get from your parents. Seek professional help to dig deeper if you suspect this is true.